I haven’t had many opportunities to get into the Yosemite high country since Tioga Pass opened, but I hope to head up there soon – maybe even this afternoon, since it looks like some clouds are building. Clouds and thunderstorms always make the summer days in the high country interesting, and potentially photogenic. 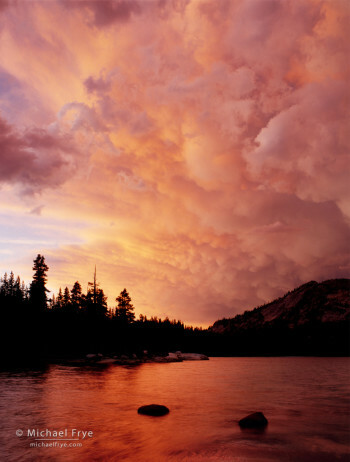 This photograph, from July of 2003, shows one of the most spectacular cloud formations I’ve ever seen. Claudia and I were in Tuolumne Meadows, and watched and photographed a thunderstorm move through from east to west. I hoped that after the storm passed we’d see some interesting light, but no such luck – it was just overcast. So I decided to follow the storm, and drove west toward Tenaya Lake. We stopped near the eastern end of the lake. I got out of the car and looked out to the west, but the scene didn’t look very interesting in that direction. Then I looked over my shoulder. Holy crap! I saw this turbulent line of clouds, lit by the setting sun, and knew immediately that I was in the wrong spot – I needed to be on the other side of the lake. Although spring officially began two days ago, here in California we’ve had springlike conditions since February, while in the northeast spring is just a rumor. 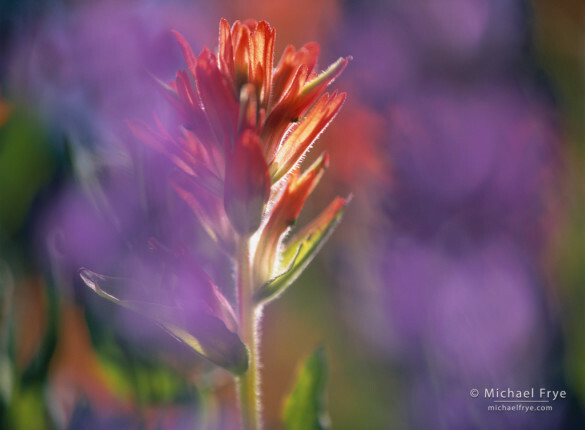 But flowers will bloom everywhere, eventually, and it’s a great season for photography. 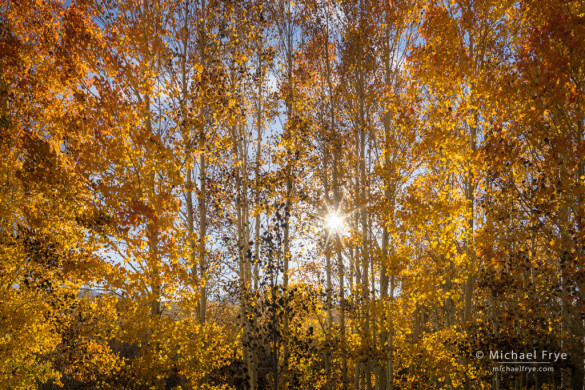 Late-afternoon sun in an aspen grove, Eastern Sierra. Backlight makes autumn leaves glow, but to avoid lens flare you have to either shade the lens (if the sun is out of the frame), or partially hide the sun behind a tree, as I did here. Light is a vital aspect of any photograph, and always the first thing I think about when deciding where to go with my camera. The more you understand light, the better your photographs will be. Any kind of light can work for fall color – under the right circumstances. But some kinds seem to work better than others. 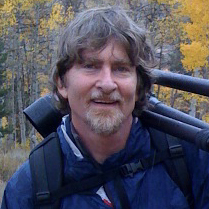 While photographing and leading workshops in the eastern Sierra, I was usually looking for backlight or soft light on the aspens – or best of all, soft backlight. Moon setting over Tenaya Lake, Saturday morning, 5:42 a.m. Sooner or later, every landscape photographer has to decide whether to stay put and hope that the light gets better, or move somewhere else. Last Saturday morning, on the last day of my Hidden Yosemite workshop with The Ansel Adams Gallery, we rose early and drove to Tenaya Lake to capture the moon setting over the water. On our way there we noticed low-lying mist in Tuolumne Meadows. 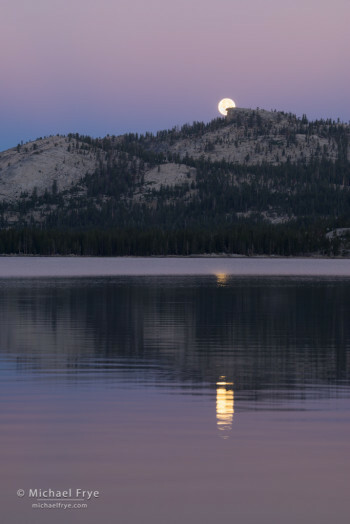 We photographed a beautiful moonset over the lake, but as soon as the moon dropped below the ridge we drove back to Tuolumne. The mist was still there. First we ran out to a small pond to catch the sun lighting some small clouds above the high peaks to the east. Then we spotted a herd of deer off to the left in the mist, so we quickly changed lenses and photographed them until they moved away. By then the sun was hitting Unicorn Peak, so we walked about a hundred feet north to get a reflection of the peak in the pond, and waited until the sun grazed across the foreground. 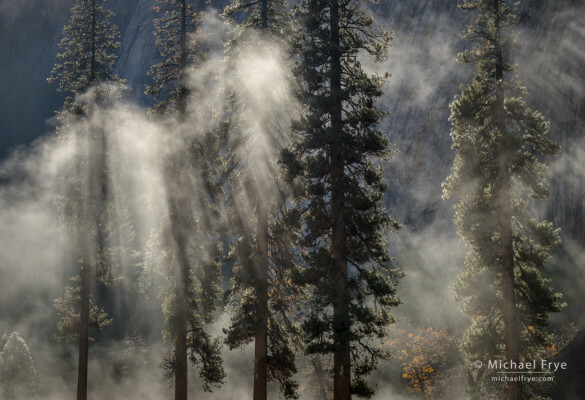 Then light started hitting the mist and trees behind us, so we moved again to get closer, and put the sun behind trees where we could see sunbeams and starbursts. And then the sun rose higher, the mist disappeared, and the show was over. The whole sequence lasted about 40 minutes. In this case, the light and fog were changing quickly, so we had to switch lenses and move our feet if we wanted to catch those fleeting moments. But three years ago, during the same workshop, a similar situation required waiting patiently for the light to change. 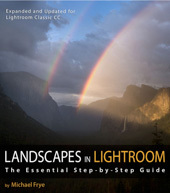 It should be obvious that weather and light are important aspects of landscape photography. No matter where you are, it pays to keep an eye on the weather, and to learn local weather patterns. We arrived in Crescent City about five days before our redwoods workshop was set to begin. Our first night there some showers moved through, and at sunrise it was gray and raining. But online radar and satellite images showed that the showers might end soon, so I prepared to go out. Then through our hotel room window I saw a rainbow! 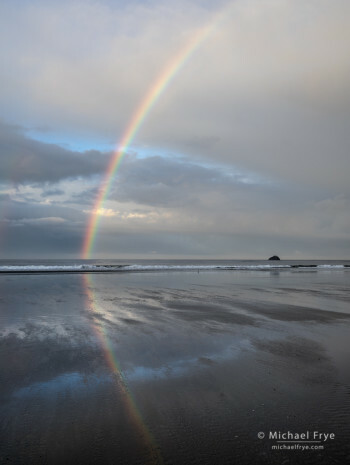 We made a dash for the car, drove out to Crescent Beach, and luckily the rainbow was still there (right). The weather then settled into a more typical pattern for the season, with frequent coastal fog and low clouds in the mornings, giving way to clear skies in the afternoons. This pattern should be familiar to anyone who has spent time along the California coast in summer. This fog is the perfect complement to redwood forests. The rhododendrons were also putting on a great display this year, so for the first part of our workshop, and while scouting beforehand, we had beautiful conditions in the redwoods, with fog, rhododendrons, and even sunbeams. But on the last day of the workshop the wind shifted and pushed the coastal fog offshore. This also happens frequently along the northern California coast, even in summer, as any disturbance in the weather pattern can change the winds and move the fog out to sea. But the offshore wind produced a different kind of fog – valley fog along the Klamath River. I didn’t think we would see valley fog during this visit, because valley fog usually requires damp ground from recent rains, and there hadn’t been much rain in the area. But apparently the river itself provided enough moisture to create fog. This time the fog flowed along the river toward the sea, and it was local enough, and low enough, for us to get above it near the mouth of the Klamath River. It was a special treat to look out over the fog bank, and then to watch and photograph the sun breaking through the fog and lighting the surf.